Born c1855 at Edmonton, England. 1898. Was a Sub Inspector at Narrandera. 15/10/1898, in the Australian Town and Country news paper. The police district is under the control of Sub-inspector Grugeon, and the local force comprises, in addition, four footmen and three troopers. The gaol is in charge of Senior constable Bowman. 1909. Promoted from Inspector to Superintendent. Police Superintendent Grugeon was entertained at the Woolpack Hotel, Parramatta, at a farewell fraternal gathering, on the eve of his departure for Deniliquin to take charge of the South Western Police District. The Mayor (Alderman Haugh) presided, and there was a large attendance of prominent residents, magistrates, court officials, and others. Among the speakers were Colonel Ferris, -ex -Superintendent Brennan, Mr. M. S. Love, S.M., Superintendent Day, Mr. G. Addison, C.P.S. and Parramatta Chamber Magistrate, Father O’Reilly, Dr. Kearney, and Sergeant Lucas. Superintendent of Police Henry Grugeon, of Deniliquin, died about 6 o’clock on Tuesday morning, as the result of a buggy accident. It appears that the superintendent was out driving in his buggy, with a pair of horses, accompanied by his son Stephen and daughter Mary. The horses became restive on Mathoura road, about three and a half miles from Deniliquin, and bolted, and, on turning short, the buggy capsized, throwing the occupants out. Mr Grugeon fell on his head, and received several nasty cuts on the head and face. He was unconscious. His son at once went to the freezing works and telephoned to Dr. Marsden, who went out and brought Mr Grugeon to his home, where he was attended by Dr Marsden and Hoskin, but never regained consciousness. The son and daughter received only a few scratches. 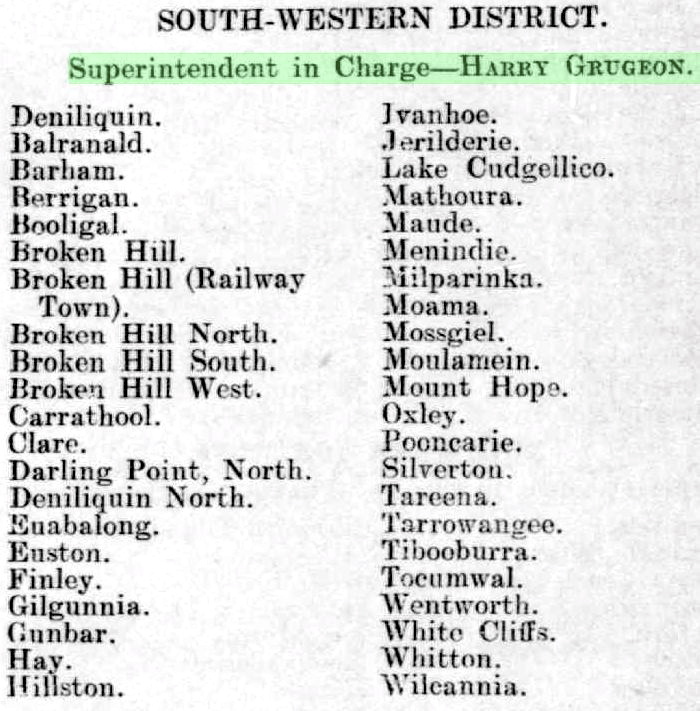 Mr Grugeon was inspector in charge of Parramatta before being appointed superintendent at Deniliquin. At the Parramatta Police Court on Tuesday sympathetic reference was made to the death of Superintendent Grugeon by Mr E L Maitland, S.M., by Mr E K Bowden on behalf of the legal profession, and by Inspector Bedingfield ( possibly Q # 2799 ) (deceased’s successor at Parramatta) on behalf of the police. His death was also mentioned in ‘The Argus’ Melbourne. Not transcribed. He left a wife, 6 daughters and 3 sons. His wife Johannah died 28/7/1945 at Lewisham Private Hospital 28/7/1945. 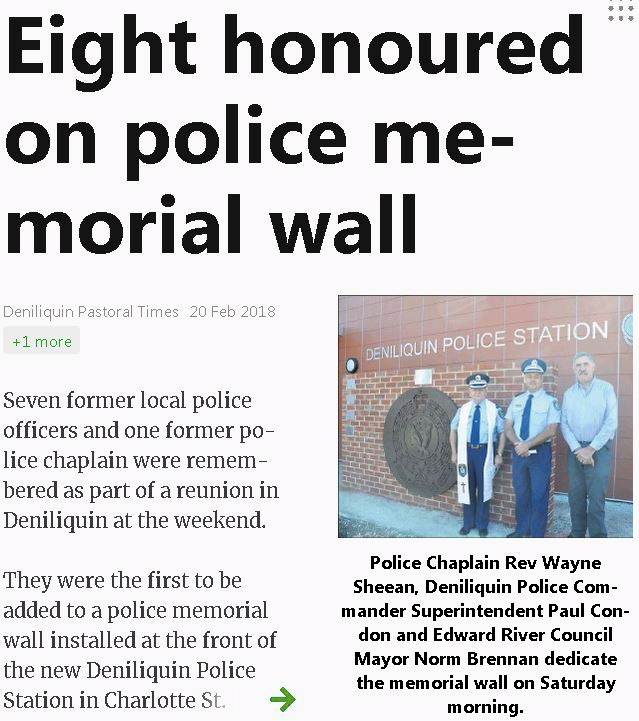 On Sunday afternoon (reports the Deniliquin ‘Independent’ of August 18) a large number of representative towns people, including the aldermen, of the municipality, attended at the local cemetery to witness the unveiling of the beautiful monument erected by a section of the police force of New South Wales, to perpetuate the memory of the Late Superintendent Grugeon, who was killed by an unfortunate buggy accident in January last. All the members of the local police force were present. Messrs. J. and H. ( Harry ) Grugeon, two of deceased’s sons, had also journeyed to Deniliquin, to be present at the ceremony. The monument is a beautiful piece of work, and was executed by Messrs. Wilson and Co., of Bendigo, which firm was represented at the unveiling by Mr. H. M. Hammer. The design is a very choice one, being a pedestal with carved drapery, surmounted by a beautifully carved figure representing an angel with arm extended dropping flowers on the grave beneath. The pedestal and figure are worked from the best Carram marble. The monument is supported by a base of Harcourt granite, with two sets of kerbings of the same stone. Marble posts with marble kerbings, neatly moulded, take the place of the customary iron railing, while the inside of the grave is covered with black and white marble tiles. The monument bears the inscription, ‘In memory of Harry Grugeon, Esq., J.P., Superintendent of Police, Deniliquin, died 10th January, 1911, as the result of a buggy accident. 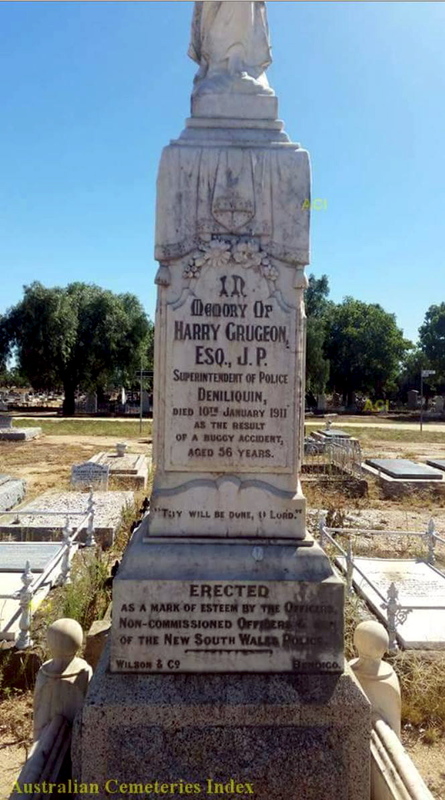 In the early part of this year, the popular Superintendent of Police at Deniliquin Mr. Harry Grugeon, J.P., died from injuries received in a buggy accident and since then the members of the New South Wales police force have decided to commemorate his memory by the erection of a monument over his grave in the Deniliquin Cemetery. The design selected is very choice, being a pedestal with carved drapery surrounded by a beautifully carved figure representing an angel with arm extended dropping flower’s on to the grave beneath. The pedestal and figure are worked from the best Carrara marble. The monument is supported by a base of Harcourt granite with two sets of kerbings of the same stone. Marble posts with marble kerbing neatly moulded take the place of the customary iron railing while the inside of the grave is to be covered with black and white marble. The work has been entrusted to Messrs J. B. Wilson and Co., the well known firm of monumental sculptors of this city and is being prepared by them at their works in Mitchell street. 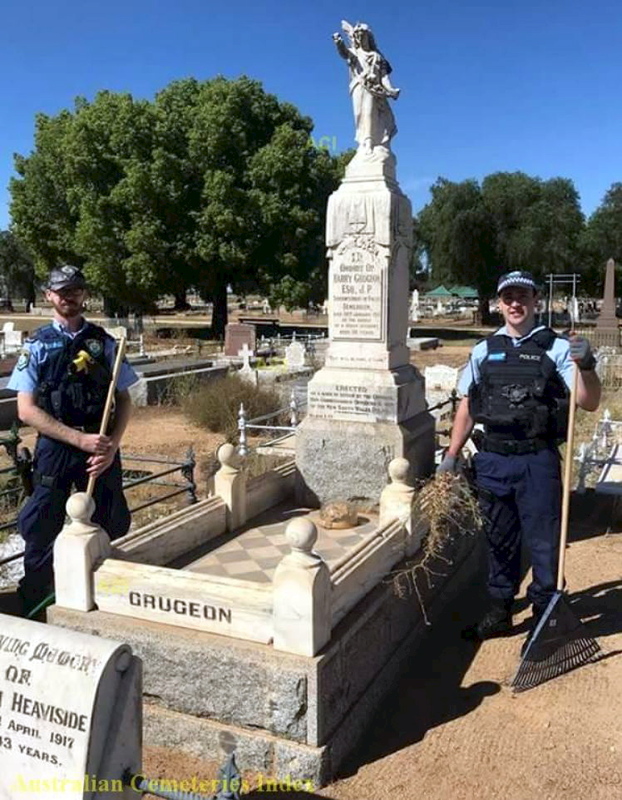 A marble tombstone, suitably inscribed, has just been completed over the grave of the late Superintendent of Police, Mr. Harry Grugeon, the cost of which was borne by the police of the South-western and Parramatta districts. 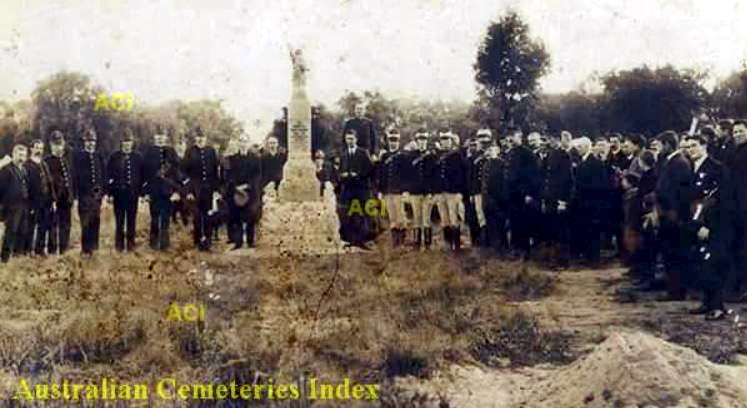 The Inspector-General of Police, Mr. Day, will unveil the monument at the cemetery here next Sunday. Mr Harry Grugeon, who is leaving Narrandera, after a residence of ten years, during the greater part of which period he had been engaged in the law office of Mr Quirk, was tendered a farewell by his many friends on Wednesday evening at the Railway Hotel, and presented with a valuable gold albert. Mr Grugeon, who is a son of Inspector Grugeon, has accepted a position with Messrs Atkinson and Warren, solicitors, of Hunter street, Sydney.